Arctic Warriors Testing Set - test our products easily and affordable! Would you like to know Arctic Warriors products or introduce them to a friend of yours? Delivery in an envelope directly to your home door! During December we will include a free postcard from Lapland. If you wish us to send the package directly to someone, remember to choose “delivery to a different address”. You can also ask as to write a little note from you by mentioning this in the comments of the order. HOX: only one introduction package per person! 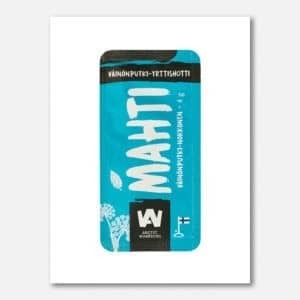 Arctic Warriors testing set helps you through the daily challenges: MAHTI boosts your immunity, SINNI supports your physical and mental performance and PUHTI gives you natural energy and relief to the sweet tooth. Enjoy as such by folding in the middle, or mix with smoothie, yogurt, porridge or tea. All herbs are from Lapland. The herbs are handled with care by hand. 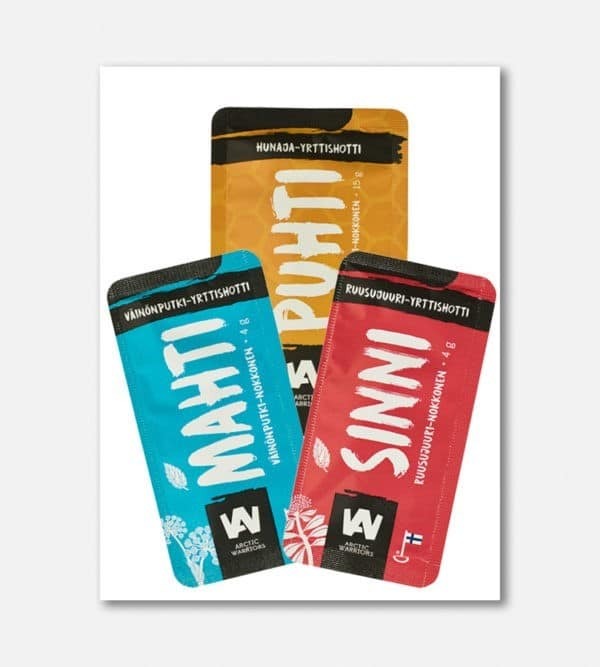 They are extracted at our home farm in the village of Narkaus and packed in Tallinn, Estonia, which is the nearest place for this kind of packaging. Hyvän kokoinen testipaketti jonka avulla löytyi Sinni käyttöön.